Influencers Panel Series: Key Use Cases for Network Virtualization: How and Why? In this two-part series, a panel of top influencers will share their experiences with network virtualization and VMware NSX, how it is being used by organizations as they move toward a fully software-defined data center, and what its deployment requires. You’ll hear valuable advice and use cases for transforming your data center into one that’s more agile, secure and scalable. 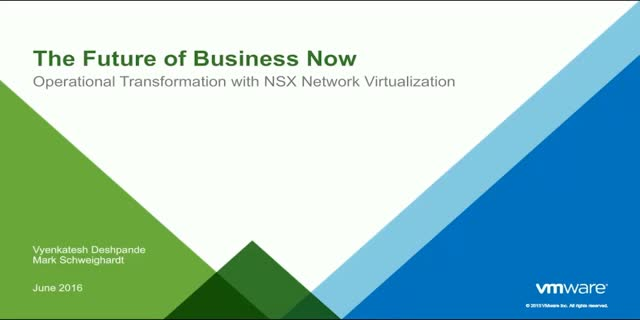 Join us for an open panel of NSX top influencers in a no-slide webcast conversation. They’ll explore how enterprises are using NSX for multiple use cases not previously possible with traditional data center infrastructure. Get insights from their first-hand experiences and IT outcomes that are resulting in unparalleled speed, agility, and security – with orders of magnitude better economics, flexibility, and choice. Title: Influencers Panel Series: Key Use Cases for Network Virtualization: How and Why?